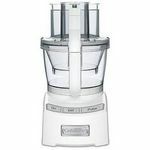 We were very lucky and had the Cuisinart 14-Cup Food Processor donated to the local homeless shelter I volunteer at. 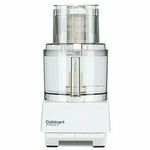 It is a very powerful appliance that can make large batches of sauces, soups, salsa, chopped vegetables, shredded cheese, and it kneads dough for bread or pizza crusts. Because we are feeding so many people, we need something that can quickly process large amounts of food items. This appliance is most frequently used for chopping vegetables and making tomato sauce. You can chop food, shred food, and puree things, even meat. 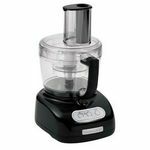 It is really a versatile food processor. If you want even more versatility you can go online and buy different blades. They offer many different blades including ones for grating and french fry cut blades. The downside to this appliance is the cost. 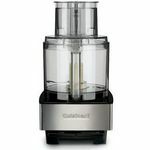 Because it is Cuisinart brand it is more expensive than some other models. As I stated before, we were lucky and had it donated to us. 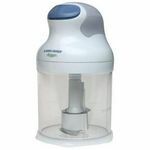 If you can afford this food processor, I HIGHLY recommend it for just about any job in the kitchen! Power This is a powerful appliance! With the touch of a button you can puree, chop, or shred large amounts of food. Ease of Cleaning If you are washing this by hand, it can be a slight challenge to clean. However, you can simply put it in the dishwasher and avoid the hassle of cleaning it by hand! Durability If I remember correctly, the shelter has had this appliance for about 3 years and when it was donated to us it was used. It is very durable, just like most of Cuisinart appliances! This rocks for making dough. I'm a bread maker and find this machine really makes the job quick and easy. And when making pizza, I can whip out the dough, then quickly shred cheese and pepperoni for toppings. Power Plenty of power for tough jobs. Safety Will not run unless top is secure. Really safe. I have had this small appliance in my kitchen for over 10 years. I absolutely love it. I have used this to chop all different types of vegetables. I have used it to puree vegetables for sauces and other items. I like that the lid has to be locked into place before you can actually use the chopping mechanism. There are only three pieces that need to be washed and it can easily be placed in the dishwasher to be cleaned for the next use. Consistent chopping even when cup is filled almost to capacity with no loss of power and is heavy enough to stay put when processing heavy items. Sticky items, such as meat, gets pulled in from the sides of the container with minimal need to scrape sides and push down ingredients in the container. The unit is also easy to clean after using. I've had this machine for several years and really love it. The last couple of years I began canning and used it a lot for tomatoes to make salsa and tomato sauces and to shred zucchini to freeze. Would highly recommend this product. Power This is a very powerful machine. It can shred a zucchini in just seconds. I also use it to shred cheese, carrots to make carrot cake. Safety Very safe machine, will not turn on if not put together correctly. You do need to cut your vegetables up Julian style to get them to fit in the top of the lid so there is no fear of cutting your self on the moving blade. Ease of Assembly Once you do it once, it becomes very easy. The only down fall is storing all the parts. I put them inside the plastic bowel but it is kind of big and I find it somewhat hard to store because I have a small kitchen. Ease of Cleaning I put the blades and bowel along with the lid into the dishwasher and have not had any trouble. Durability I have had this machine for almost 7 years now and it works just as good today as it did the first day I purchased it. 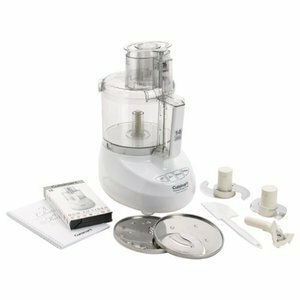 If you can align all of the parts then this food processor is very easy to use and it can be cleaned in the top of the dishwasher. It is wonderful for making homemade sauces, salsas, chopped veggies, just about anything you don't want to spend extra time cutting with a knife. I've had mine for at least a decade and it still works like it did fresh out of the box. We wanted a large capacity food processor so that we could make large patches for freezing and canning. We keep this on our counter and use it several times a week for processing, slicing, and shredding. The blades are very sharp. We wash it in our dishwasher so clean up is easy. It has the standard settings and has a safety mechanism. After having it for 5+ years we have never had a problem. The workbowl is the original one as are all the pieces. The feeder tube is a good capacity and the only thing we've needed to cut into smaller pieces to get through it are whole potatoes. We love our workhorse and no job for it is too small or too large. I absolutely hate to shred cheese and slice things, but I LOVE to cook. I had been looking at food processors for a little while, but had settled on getting just a tiny counter size one because of price and lack of space. My family surprised me with this larger one and it's amazing! I never shred cheese anymore and use it to cut all my veggies. I've even used it to make my cream of potato soup and oh boy does it make it easy! I love to bake and make graham crackers, and this made it easy. The only downside is that the lid can be difficult to clean, but overall I love that I can just toss it in the dishwasher. Safety Just watch out for edges of blades when storing (sliced my arm open this way). My husband and I spent months checking our reviews on products before settling on this one.This is the best food processor out there. We looked all over for one that is large enought that we can make large batches of things that we can freeze. This is the only one of this quality that is 14 cups (HUGE). We bought this for Christmas and couldn't be happier. Dices, blends, chops.....all within seconds. We used to have 3 appliances (blender, mixer and food chopper) to do all the things that can be accomplished now with just this one item. The size is awesome for making large batches of soups, sauces, cole slaw...etc. This is easy to take apart and clean too! Just be careful, the blades are extremely sharp. If you are looking for the all around kitchen gadget, this is the one for you. so versitile that we just keep it right on our kitchen counter. Time to ditch our other things so we have more room in our cupboards! !